From October 2-4, 2014, the Society of Catholic Liturgy is meeting in Colorado Springs. The theme for the conference is "The Temple Transformed." To this end, I am giving a concurrent address on "The Temple of the Holy Spirit in the Writings of the Blessed Elizabeth of the Trinity." The last post and this one are some of my notes. Blessed Elisabeth describes praising the glory of the Lord in terms of music. The soul is a lyre. Emotions, passions, thoughts and imaginings are the strings that must be tuned. The Holy Spirit is the musician. Such praise takes up the inner life, it constitutes the existance of the soul as a temple of the Holy Spirit. She compares the praise offered by a soul with descriptions of heaven found in the Revelations. This is an invitation to think about the analogy between the soul as a kind of heaven in faith and the heaven of glory that awaits us. In each one there a chorus breaking out. The inner sanctuary of one's very being, like heaven, is meant to be filled with wonder, adoration and the jubilation ceaseless praise. Such joy is for her a divine harmony played on the strings of the heart. She describes a secret canticle learned from Mary at the foot of the Cross, and at the same time a heavenly hymn which lifts the soul out of time and into eternity. Such praise clings to the glory of the Risen Lord in the midst of all of life's difficult questions because it discovers itself embraced by love. Music involves harmony and rhythm, the resonance of deep movements of the heart with vast horizons of the world, a mediaton of beauty, of glory, a shining forth of what is good even when it is difficult to discern. For the soul filled with the Holy Spirit, canticles of the heart offered to the Lord in praise are born not only in the midst of comfort, consolation and satisfaction, but especially in those piercing moments of personal inadequacy, failures and voids. This divine music, music that Elizabeth describes as the Holy Spirit playing on the strings of the heart, is not an escape, but an expression of real life, of an existence open to the possibility of hope. The divine indwelling establishes a center point for the heart. In this axis for the inner world, the power of God is made known even as the circumstances of life spin out of control. Real life does not threaten the music or diminish such praise. The canticles of a soul animated by the Holy Spirit are born in between this divine reality in the depths of the soul and the earthly, created reality through which the soul is living and enduring. The temple of the Holy Spirit, a Christian courageous enough to stand in this gap by choosing faith, by choosing joy, mediates grace in the real world through this kind of praise, and in this jubilation renders heaven and earth vulnerable to one another. Faith accesses this center through what Blessed Elizabeth proposes as a simple loving movement toward God. This is a silent humble adoration of the One who is totally other than me but who loves me exceedingly, and it is this movement toward the personally present God who loves that reverberates and explodes into a praise that must be expressed: a song, a canticle, a hymn of love. Those who have heard such canticles know that the human heart raised by grace to this true worship is unconquerable. In the midst of every trial and hardship, such a soul is become the praise of glory, a temple where the joy of the Holy Spirit overflows and fills the whole world around it. Blessed Elisabeth of the Trinity became aware of the indwelling presence of God at her First Communion. This initial experience was satiating. Whereas the other children were ready for the wonderful reception prepared for them after the liturgy, witnesses describe Elisabeth captivated by her encounter with the Lord. She seemed to be filled with wonder over His new presence to her and teachable, open to new words of wisdom for her life. Witnesses also describe the beginning of a new self-control. This self-mastery was not all at once, but an unfolding reality whose roots go back to this moment of encounter, this experience of a love that fed her soul. There is infact a correlation between the transformed life that amazed both friends and family and a growing awareness on her part of the loving presence of the Trinity in her soul. Years later as a Carmelite she writes a powerful prayer that brings together the doctrine of the Divine Indwelling of the Holy Trinity and her experience of contemplation. "O My God, Trinity Whom I Adore" is a petitionary prayer, a cry of the heart for the peace and stillness that only God's presence can establish in the soul. It is a prayer that reaches out to the ultimate end of the divine economy while always remaining mindful of the difficult ambiguities besetting a soul that yearns for God. This prayer confronts weaknesses, emptiness and inadequacy with hope. It is important to note that this prayer describes the indwelling not as a completed fact, but as something unfolding, as a work that only God can bring to completion. Blessed Elisabeth reveals the divine presence as intrinsically dynamic, a reality that raises human nature above itself. As the presence of God establishes peace in the soul even in the midst of great difficulties, the Holy Spirit renders the Christian capable of participating fully with his own life in the Son's perfect offering to the Father. In short, the Divine Indwelling dynamically perfects the spiritual worship that faith in Christ makes possible. This is a theme we find also in the retreats she authored. These spiritual reflections she wrote in the final stages of what was then a terminal disease. She returns not only to the theme of the divine indwelling as a source of peace in the soul, but also elucidates the particular activity this heavenly peace makes possible: perfect praise. One is struck by her conviction that to be the praise of glory is not simply a noble ideal to which she aspires, but her sacred name, her very identity, the secret purpose of her life before God. In her Last Retreat, she begins her reflections in a truly ecclesial voice, the voice of the Bride of Christ. The song of the Bride for her Bridegroom she describes discloses this kind of praise in terms of a secret longing that Christ and the Church share. What is more, she understands herself as personally participating in this love. She sees herself as a kind of personification of the Bride of Christ, a Bride who sings to her Beloved a canticle of love and devotion, and this even as her own life plunges in its final agony. Here, Blessed Elisabeth expands our understanding of the divine indwelling. The presence of God in the soul is not only satisfying and morally transforming, it is not only psychologically therapeutic and an answer to difficult interior experiences, this divine presence is also the source of a whole new range of spiritual activity, an ecclesial existence that breaks out in true worship. The soul filled with the presence of God is being transformed into a kind of heaven, fashioned as a dwelling place for the living God, built up as a temple, a particular and unrepeatable realization of the Church, where the glory of the Lord rests. In the soul filled with God there is finally the freedom to sing His praise, not in some distant future, but in the vast horizons of the present moment. In the seventies, as a boy, I heard that a pilgrim from Pennsylvania had walked through California. Many of my friends from Santa Cruz went to meet him. They were young adults and what he witnessed to them changed their lives. He told them how he made God the center of his life and allowed himself to be completely vulnerable to the Lord in prayer. He claimed that living this way was the source of an abiding peace and that anyone who would live their lives loving God could know this peace too, not only in this life but also in the life to come. Just by walking by foot where he believed God called him to walk, Pilgrim George helped us believe that God truly loves us and that loving God is the secret of happiness - this is a truth strong enough to build a whole life on. As a result, some of my friends discovered the joy of doing something beautiful for the Lord with their lives. Their response, in turn, had a ripple effect throughout our whole community. Years later, when I was a student in Rome, some Jesuit priests had invited me to dinner and they began to talk about a foot pilgrim who was walking through India. After a few questions, I learned it was the same pilgrim George who had influenced so many of my friends during my youth. It was obvious that his witness to God's love was compelling to them as well. So again, he helped me think about how I was living and how I ought to respond to the goodness of God. 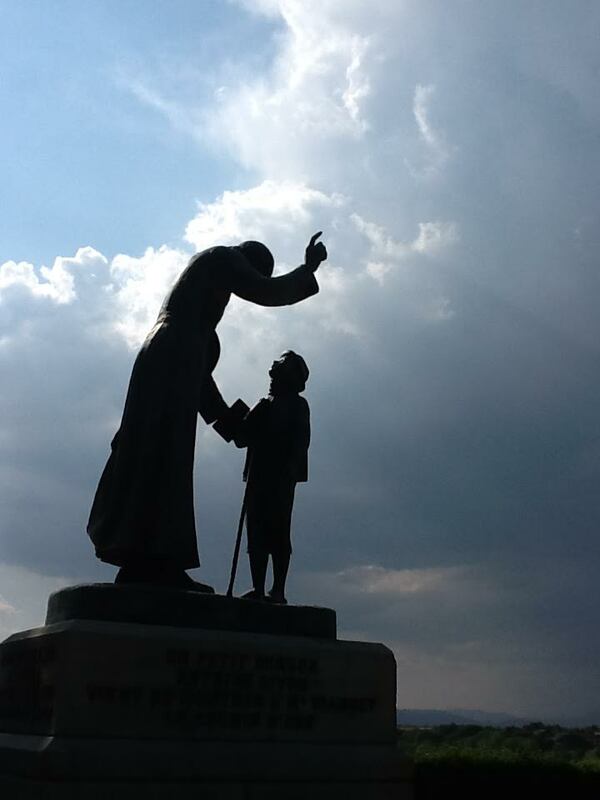 In these ways, Pilgrim George, even though I never met him, became an important influence on me, personally. I have heard he had this impact on many other men and women around the world -- and in a world that has become increasingly hostile to God, this is something remarkable. After over forty years of being a foot pilgrim, he is now devoting himself as a poustinik - a life of silence, solitude and contemplation, but also witness and service. Click here to watch an interview he gave to Christ the Bridegroom Monastery in Ohio. On September 6, 2014, Archbishop Aquila is hosting a special catechetical event to repropose the ancient order of the sacraments of initiation: Baptism, Confirmation and Eucharist. The Catechetical Congress draws its name from a passage in the Catechism, "Treasure of Divine Life." These are notes from a presentation in which we will consider how the signs used in the sacraments of Baptism, Confirmation and Eucharist have a certain order in the Bible, and this order reveals the splendor of what it means to be fully human and fully alive. "Christ instituted the sacraments of the new law. There are seven: Baptism, Confirmation (or Chrismation), the Eucharist, Penance, the Anointing of the Sick, Holy Orders and Matrimony. The seven sacraments touch all the stages and all the important moments of Christian life: they give birth and increase, healing and mission to the Christian’s life of faith. There is thus a certain resemblance between the stages of natural life and the stages of the spiritual life" (CCC 1210). Analogy between life and the spiritual life serves as a basis for understanding the order of the sacraments, including the order of initiation. Yet to understand this analogy, it is not enough to appeal to the visible elements and gestures as we know them outside the logic of our faith. It is true that the elements of water, oil, myrrh, bread and wine belong to the sphere human activity from ancient times. Thus, when Christ and the Church raised them for use in the mystery of Christian initiation, they did so building on ancient meanings already deeply part of human experience. Yet, to understand the wisdom of the Church, among the manifold of signification contained in these products of the earth and human industry, there are also those special meanings we find in the Holy Bible. It is a contemplation of these special meanings that reveals a deep truth about the order of initiation in the life of the Church. Because the salvific meaning there is not only inspired but inerrant, the Bible contains the deepest and most important meaning of these sacred signs. The Word of God reveals the heart of the Sacraments. The heart is a drama, a contest, a testing of love. Baptism, Confirmation and Eucharist are three moments in this divine story - a story that is at once the story of all humanity and that has the possibility of being the story of each soul. The story of the victory of good over evil, of the triumph of the Lamb over the powers of sin and death.